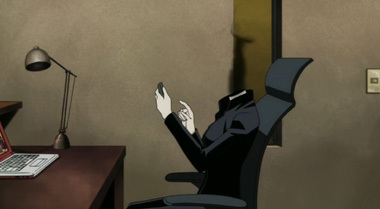 Durarara is a tough show to describe: it features gang warfare (primarily), but also stars some supernatural characters along with internet message boards. It also can be quite wacky and goofy at times, but quickly swing the pendulum the other direction and into more grim territory. 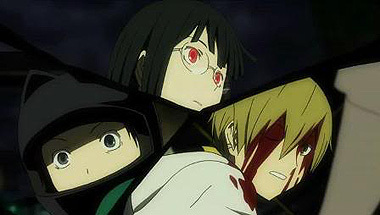 Perhaps this simplest description is this: Durarara takes a bunch of unique characters (all with their own motives and skills) and tosses them into an unpredictable world. Sometimes things go their way, and other times it all falls apart. Often violently so! 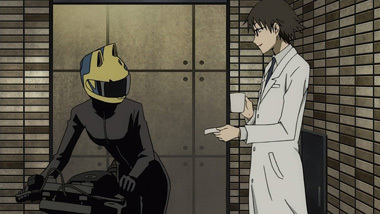 The character linking everyone together (and the closest to a main character) is Celty Sturluson, a black market delivery biker who also happens to be a Dullahan. Yes, she's an Irish fairy of legend, but her head has gone missing, leaving her to live life without it. She's made her living with another black market fellow, a doctor named Shinra Kishitani, and together they're quite the adorable couple. 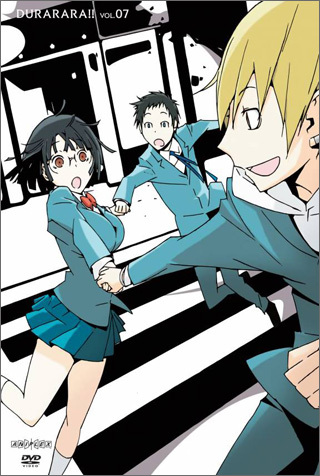 The other main thread is between three students at Raira Academy: Mikado, Masaomi, and Anri. All have secrets they're keeping from one another, and their friendship has been tenuous over the previous season. Perhaps that's the biggest warning about Duarara x2: there's no reintroduction for new viewers if they haven't seen season 1. We hope you watched it, because x2 jumps right back into the story immediately following the final episode from last season. Don't expect much handholding! We're introduced to several new characters over the first few episodes. Some were briefly seen in season 1 but barely warranted any screentime, others are totally new elements mixed into the chaos cocktail. The draw is always the characters here, so the question is: are they compelling? Well, the idol Ruri appears to be fairly uninteresting at first, but her secret revealed in episode 3 quickly adds an exciting twist. 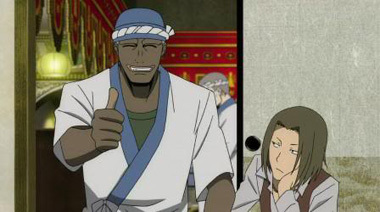 Aoba, a new student at Raira, acts a little more daring than the original student trio of Mikado, Masaomi, and Anri, as though he was inserted primarily to spice up their storyline (which was admittedly the most boring element of season 1). Izaya's two younger sisters, Mairu and Kururi, serve the best possibly purpose: they annoy Izaya. 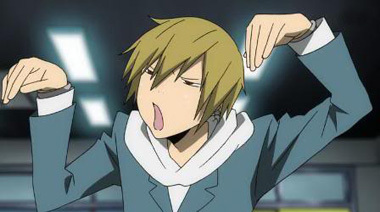 Anything that frustrates or bothers him is a great addition to Durarara! As for the quality of the art and animation, it's consistent with the previous season, featuring a bright, dynamic opening, solid animation throughout, and wonderful character designs. 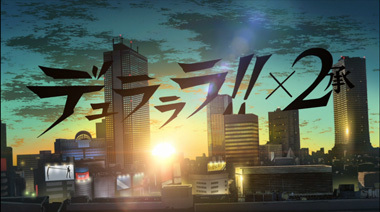 Director Takahiro Omori created this new studio, Shuka, specifically for Durarara -- and it's essentially made up of everyone who previously worked on the show at Brains Base. He quite literally "got the gang back together" to make more Duarara. We're only in the first cour of Duarara x2, with plenty more episodes to go and loaded with twists and turns along the way. 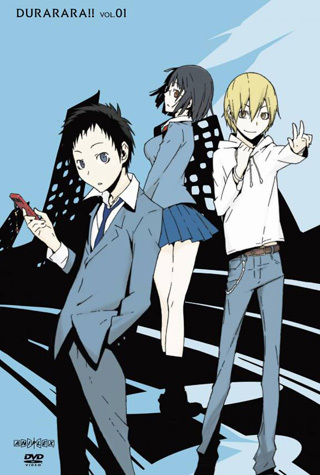 As long as it doesn't lean too heavily on the same student storylines that slowed the first season, Durarara x2 will have a great run. It's not doing anything groundbreaking, but it is consistently hitting the targets a good anime needs to hit: solid writing, great art, and unique, convincing characters. 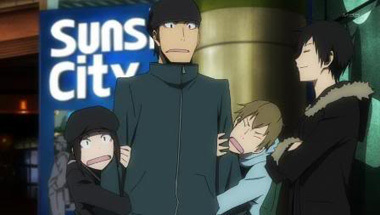 We think most readers will agree when we say that we hope Izaya finally gets what he deserves! 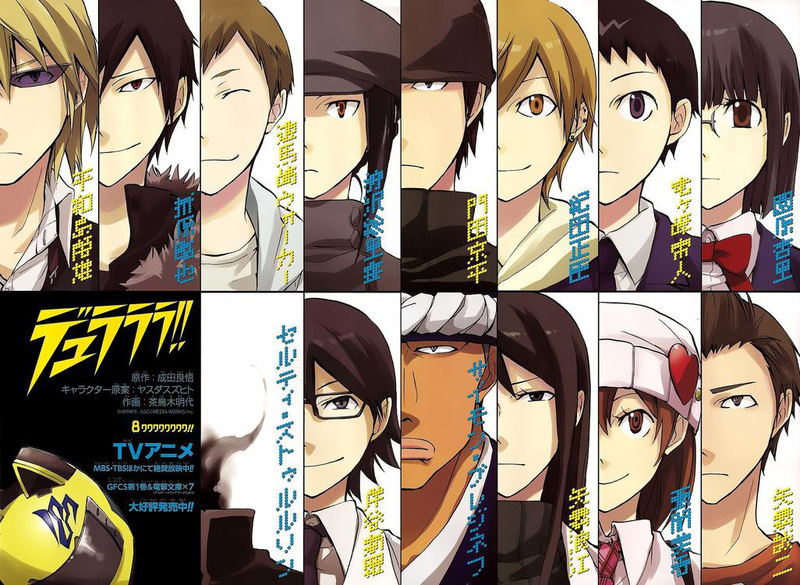 Durarara, besides being fun to say, is a pretty spectacular series. 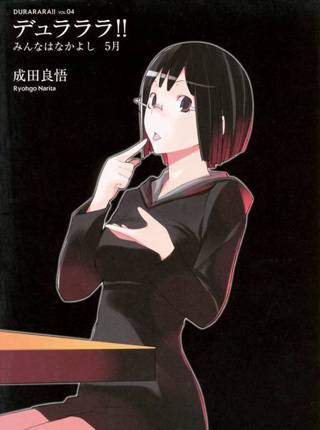 Based off of a light novel by Ryohgo Narita, series takes us into the lives of Ikebukuro, Japan. Marked by its high style and extremely large cast, the effect is to see an entirely ecosystem of he city, not just a sect within it. With a cast of around 16 protagonists, we thought the whole thing would end up just chaotic, but strong direction ties it all together beautifully. 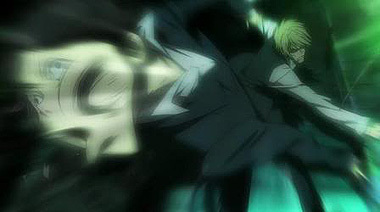 In fact, the first episode is actually played back three times, just to get the entire picture from every perspective. This could have easily gone poorly, and divested my interest in what happens, but I found that I was more and more interested in the "next" character they'd be telling the point of view of the story from. But who are these people? A manipulative information broker; introverted school girl; headless horseman. Wait, as in the Irish fairytale monster? 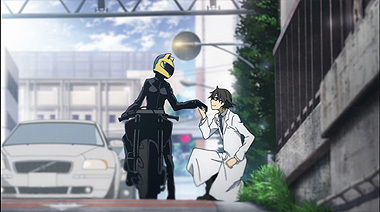 Celty, a headless horsewoman quickly breaks up the normalcy of the series. 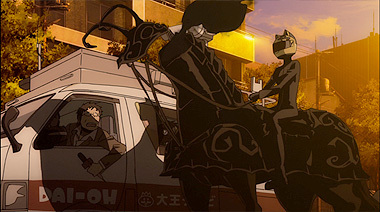 A Dullahan who has lost her head, Celty trades her horse for a motorcycle, and prowls the city as a transporter for hire. Yet, despite having such hints of lore, the show is not focused on fantasy. A truly progression based story, the first twelve episode exist almost entirely to established the cast, and their relatively loose relationships (if any) to one another. This is followed by the payout, where they are then manipulated into artificial conflict. To what purpose? To what end? Who cares? While I originally tagged along on the series just to get more of our headless diva (who communicates entirely via text messages,) the style and tone quickly had me in its thrall. Soon, I had new favorites, until finally, I loved everyone. Though, fair warning, this is a series by the nerds, for the nerds. Posters and marquees unabashedly drop flagrant references to other works, while some characters are defined by their status as manga otaku. In fact, these side characters seemingly exist just to compare the plot's progression to what "would" happen in a manga. Why, even the whole idea of the conflict between "internet" gangs, seems to be aimed at the shared nerd experience. 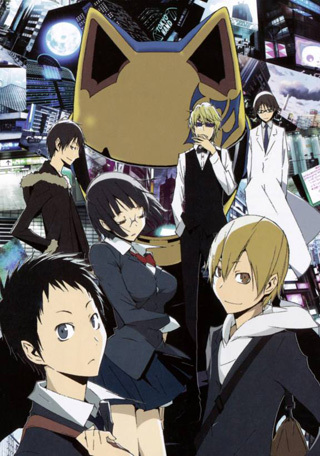 With its strong music and over the top style, Durarara is not to be missed. 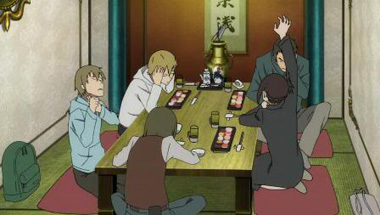 DRRR was initially introduced to many non-Japanese via its very popular anime series that aired in 2010. 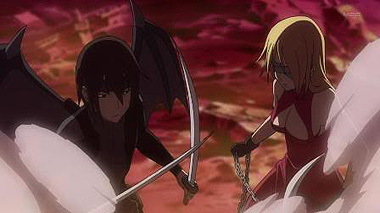 The manga is a different adaptation, and allows different fans to experience another layer that is different than the anime and its light novel counterpart. 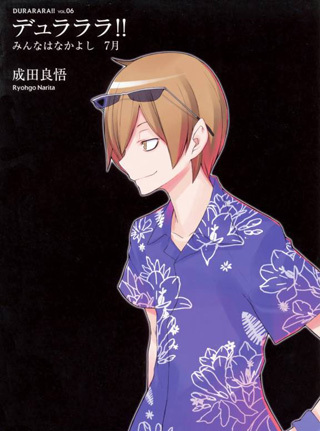 Ryohgo Narita who is the creator for this series invites readers to experience a medium and enjoy this series. 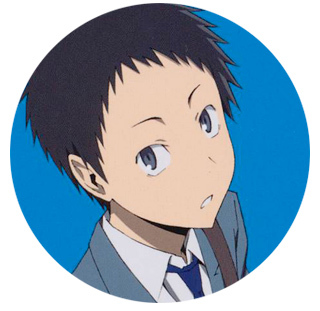 The first protagonist readers meet is Mikado Ryuugamine who is a new High school-aged resident in Ikebukuro. 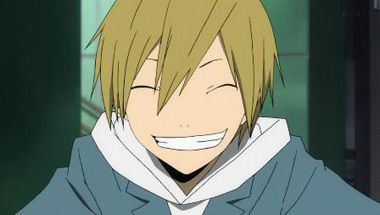 With his best friend Masaomi Kida, he learns who to know and who to avoid. The story's point of view doesn't only stick to Mikado's experiences and expands with perspectives from other characters. Interwoven with the multiple character perspectives is an ever-continuing chat room with strangers gossiping or chit-chatting. This focus on the daily lives of Ikebukuro residences and just where the story is going. Outside of seeing hands typing and screen handles, there is no certainty to know who the screen handle is. 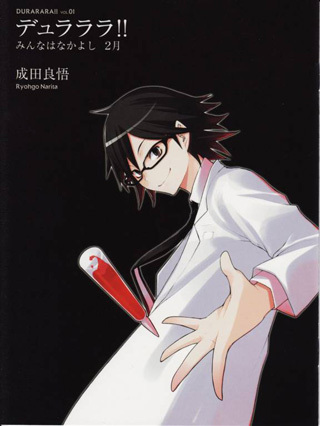 In terms of similar reads, there are some titles out there that provide the same vibe as DRRR. One of which is Baccano which is also another light series by Ryohgo Narita and has multiple point of views. Another is Densha Otoko where there is the usage of the protagonist's interaction with multiple strangers via a chat room. 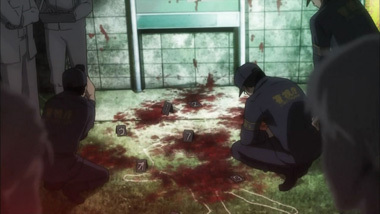 For the mysterious angle coupled with the nitty gritty, there is Darker Than Black or Higurashi no Eden. In terms of reality though, there is the social media world of Twitter that is very much a place where there are millions of strangers just talking. 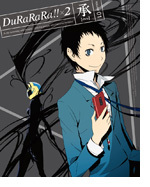 Below: Japanese DVD cover illustrations for Durarara!! 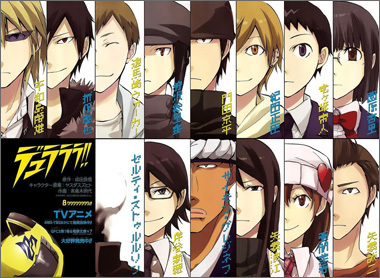 Below: Japanese manga cover illustrations for Durarara!! 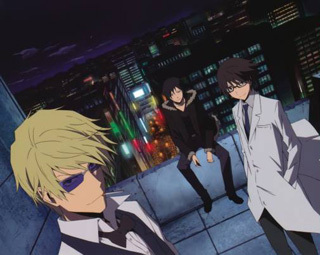 Below: A promotional illustration for Durarara! !